On Monday President Trump announced that Mexico and the United States had reached a trade agreement. The deal is expected to be finalized later this week. Kansas U.S. 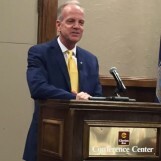 Senator Jerry Moran issued the following statement after the deal was announced. “As I’ve expressed to the administration on numerous occasions, any agreement that has been in place for decades should be reviewed and modernized, and I am pleased President Trump has reached a preliminary deal with Mexico. Kansas is an export state, and our ability to make a living is directly tied to our ability to export the goods we grow and manufacture. This initial agreement between the United States and Mexico is a needed step in beginning to inject certainty back into our trade policies; still, we must re-engage Canada – the top export market for Kansas in 2017 – to reach a trilateral consensus and deescalate ongoing tariff disputes worldwide to provide our nation’s producers with a larger degree of market expectations and stability. I will continue to engage the administration to make certain the voices of Kansas farmers, ranchers and manufacturers are being heard in deliberations,” said Moran. Congressman Marshall commended President Trump for negotiating a “win-win” bilateral trade agreement with Mexico. The deal updates the NAFTA agreement so that it meets the demands of the 21st-century global economy. “The days of taking advantage of our American businesses and producers are over. I want to commend USTR and their work to reach an agreement with Mexico. My hunch is that our agreement with Mexico will put pressure on Canada to come to the negotiating table so that we can restore a full and true modernized NAFTA agreement,” said Marshall. The Administration is expected to send their intent to sign to Congress by Friday. That notice will be followed shortly by the full text being made public. “I look forward to fully reviewing the agreement and swift approval by Congress. I’ve said it over and over again, our farmers need certainty, and solidifying this deal with our Mexican markets is a crucial piece to the puzzle. With this agreement, Kansas producers will be treated more fairly as it explicitly reduces trade-distorting policies on agricultural goods and promotes complete transparency between the US and Mexico,” said Marshall. This announcement continued the good news for the economy, with the stock market hitting all-time highs once the US and Mexico reached the trade deal.